Exclusive breasfeeding allows my baby to be with me 24/7 – babies need their healthy mama all the time not only for physical health, but for emotional, mental, and spiritual. And there’s so more! (For more information, read Real Food for Mother and Baby.) But hey, never take anyone’s word for it – do your own research with reliable, honest sources. Add milk to a large stockpot and heat gently until 180 degrees. Remove from heat and allow to cool to 110. Mix in 1 Tablespoon of yogurt starter into each quart. Put lids on the jars. Add warm water (110 degrees) to the stockpot and place the quart jars in the water bath. Place the stockpot on a heating pad (or heating element of choice) and keep the heat steady at no more than 110 degrees and no lower than 95. Leave yogurt for 24 hours. 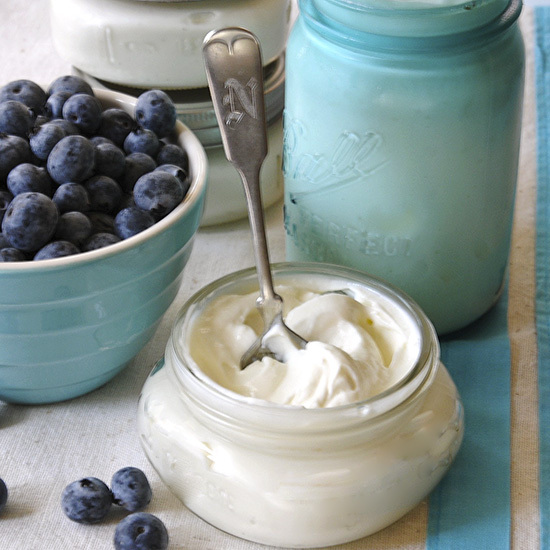 After yogurt is thickened, put it in the fridge – it will become even more solid after cooling. Scoop out 1/2 cup yogurt into a bowl. Sprinkle a dash of cinnamon and a dash of sucanat or a couple drops of stevia extract. Though I don’t like heating raw milk, for this ferment it does make the end result thicker without the use of gelatin or other thickeners. Also, using just a tablespoon of starter gives the culture space to work, which in the end creates a smoother, slightly tangy taste. This might just become my new favorite snack as well! So glad I found your page. Also glad you are a child of God. Some of the research I did said I need chromium because I get fatigued all the time.and a lot of digestive issues too.pls what do you think? I can’t find on your page how to heal other organ like adrenal and liver? Thank you for your time .you are a rare encourager . I would not add in a separate chromium, but I would add in Vital Proteins Beef Liver – that supplement alone is so amazing for recovery! Digestive issues, you could do the GAPS diet – or the anti-inflammatory diet I have on the website here. I’d add in moringa, probiotics and also a parasite cleanse (Dr Christopher or Hulda Clark or such). For the adrenals and liver help, there’s good products from HerbPharm.